Here's How Ranveer Singh Marked 1 Year Of "Padmaavat"
Sanjay Leela Bhansali's 2018 blockbuster film "Padmaavat", starring Deepika Padukone, Ranveer Singh and Shahid Kapoor clocked 1 year on Friday. On this occasion, Ranveer Singh and Aditi Rao Hydari, who played the role of Alauddin Khilji and Mehrunissa in the film respectively, shared special posts on their respective social media accounts. 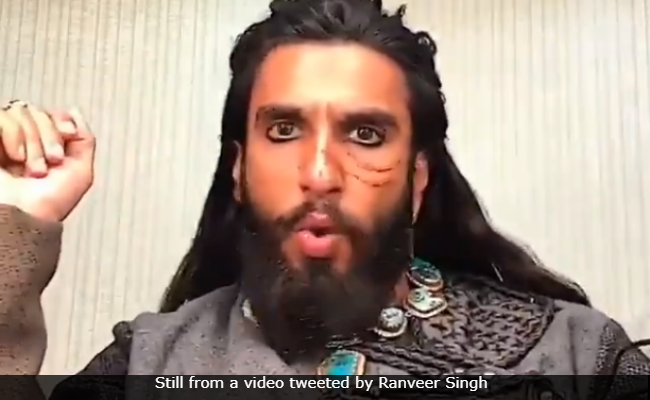 Ranveer Singh, who played the antagonist in the film, shared a throwback video, in which he can be seen dressed as Alauddin Khilji and captioned it: "Bad man having a good time. Alauddin Chill- Ji." He accompanied the post along with hashtags "#throwback," "#khilji" and "#1yearofpadmaavat." Though Deepika Padukone and Shahid Kapoor haven't shared "Padmaavat" special posts as of now but we would love to see their posts. Meanwhile, Aditi Rao Hydari, who played the role of Alaudddin Khilji's wife Mehrunissa, shared two stills from the film on her Instagram post and accompanied it along with an extensive note. In her post, Aditi described the experience of working in the film as a "dream come true" and wrote: "Last year this time. "Padmaavat"... An experience and a dream come true that I'll never be able to put into words. Thank you Sanjay Sir for Mehrunissa." She also acknowledged her co-stars Deepika Padukone, Ranveer Singh, Shahid Kapoor and the entire team of "Padmaavat." Aditi signed off the note saying, "Where is the cake?" Last year this time... #Padmaavat... an experience and a dream come true that I'll never be able to put into words... thank you #SanajaySir for #mehrunissa to the epic @ranveersingh @deepikapadukone @shahidkapoor @shobhasant And the whole team of #Padmaavat... Ps- where is the cake?! Directed by Sanjay Leela Bhansali, "Padmaavat" was one of the highest grossing movies of 2018. The film is based on Malik Muhammad Jayasi's ballad, which narrates the story of Rani Padmini of Chittor. The film featured Deepika Padukone as Padmavati, who performs jauhar along with hundreds of Rajput women, after Alauddin Khilji breeches the fort of Chittor. The film also featured Jim Sarbh.